Valor Brewpub, which will for a while be known as The Ugly Mug downstairs until it takes off like a delicious and luminous star, had its soft opening last week but now they are officially now open for business. If you’re a tl;dr kind of person, I’m just going to tell you this: PLEASE EAT A VALOR BURGER IF YOU CAN. 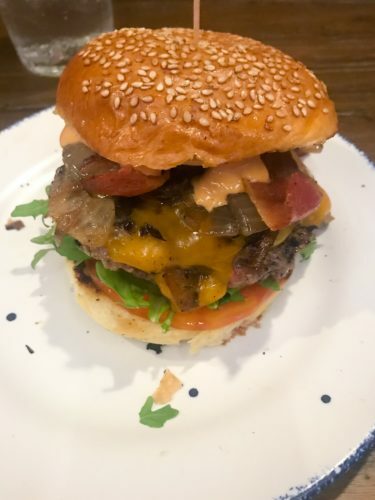 Make it work: If you have dietary restrictions, take out the bacon, hold the cheese or eat around the (pillowy, soft, delicious, soaks-up-all-the-juices) bun. If you’re a vegetarian, inhale the aroma, maybe? It really is as good as it looks. For the record, if you’re into actual fries, the boardwalk fries taste pretty good too. Crispy and delicious, they strike that delicate balance of salty and crunchy that is so crucial to a good fry. A special thank you to our server, Mitchie, who was kind and patient with me and my children. Mitchie, like the rest of the staff at Valor, is a veteran. Thank you all for your service! We will be back to try the rest of the menu, but especially the french-press cocktails– infusions made stronger by “brewing” them cold in a french press. The colors and aromas looked beautiful and intriguing. We’re also looking forward to trying the beers when the brew- part of the brewpub starts up later in the season. WHERE: 723 8th Street SE, downstairs from The Ugly Mug. WHEN: Open every day, starting at 11 a.m. The kitchen closes before the bar. For exact times, visit their website.